Maa Kushmanda is adored and worshipped on the fourth day of the Navaraatri. Maa Kushmanda dwells in the abode of the Sun God. That is why her hue and spendour is as brilliant as the sun itself. It is her spendour that pervades every plant and creature of this universe. All the ten quarters are illuminated by her divine refulgence. When this universe was non-existent and darkness prevailed everywhere, it was Maa Kushmaandaa who produced the Cosmic Egg with her mere smile. So Maa Kushmanda is also known as the creator the whole universe. 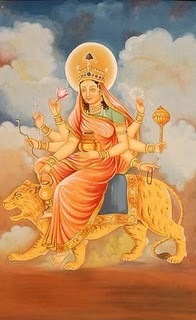 Maa Kushmanda is also named as “Adi Shakti”. She is the only one who has the power and strength to live in the core of Suryaloka. Her body shines like the glowing Sun. All directions get light from Her Divine smile including the Sun God itself. Maa Kushmanda also known as “Ashtabhuja” as she is often depicted as having eight arms. In her seven hands she holds Kamandalu, Bow, Arrow, Lotus, a Jar of Nectar, Discus, and Mace. In her eighth hand she holds a mala capable of giving eight Siddhis and nine Niddhis. She rides a lion who represents “Dharma”. On worshiping Her, ailments and sorrows are eliminated and life span, name, strength and health improved.